Cut fruit snack rolls into 12-inch pieces. Cut each piece lengthwise into 4 strips, using knife and straightedge. Roll each strip in a spiral around handle of wooden spoon. Store at room temperature at least 8 hours to set curl. Bake cake mix as directed on box for cupcakes, using water, oil and eggs. Cool completely, about 1 hour. Tint half of frosting with food color. Frost cupcakes with frosting. 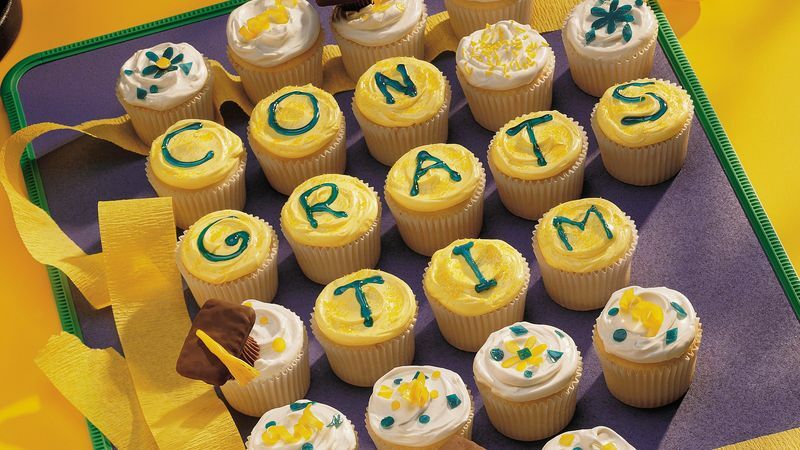 Write "Congratulations" or "Congrats" and the graduate's name on cupcakes with decorating gel. Decorate other cupcakes with candy sprinkles and colored sugar. Unwrap fruit snack streamers from spoon handles. Reshape into desired curl; place on cupcakes. Cut additional fruit snack into small pieces and flower petal shapes; arrange on some of the cupcakes. Top some of the cupcakes with candy graduation caps. To make, place small amount of frosting on bottom of peanut butter cup. Press graham cracker onto peanut butter cup. To make tassel, tightly roll up small square of chewy fruit snack; cut fringe in one end and press other end to center of graham cracker. To celebrate a special anniversary, write "Happy Anniversary" on the cupcakes.